satisfied, I will guarantee you a full refund! Every couple wants their wedding day to be as enjoyable and memorable as possible. And although there's an amazing array of wedding entertainment on offer these days, I find myself being invited to entertain at weddings all the time. Most often, I'm told it's because "this is our big day, we will be with very old and very close friends as well as our families and we want not only something different and original, we want each and every person to feel very special." 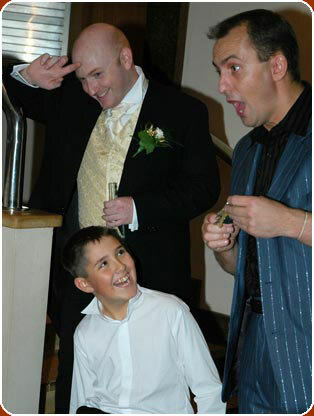 The magic I perform provides just that – a very special feeling for everyone that experiences it and I can make sure any wedding day is remembered by many for years afterwards. I've performed magic for many hundreds of weddings all over the world, so have a tremendous amount of experience to offer. Please visit my Client Comments page to read what just some happy couples have said after commissioning me as their wedding magician for their special day. 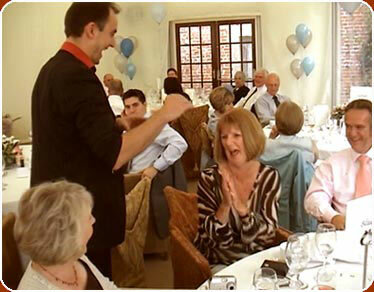 A Wedding Magician at the Wedding Breakfast can be the perfect ice breaker. During the Wedding Breakfast guests will often be seated with family members from the opposite side of the family and very often people don't know each other. That means making conversation can be difficult. I can spend a few minutes with each set of guests performing their own private magic show. The performance quickly becomes 'the talk of the table'. Each performance is a sophisticated, visual blend of sleight of hand magic, ‘mind reading’ type effects and even some pick pocketing. By the time I leave a table, your guests will be laughing, joking and discussing the improbability of the magic they have just witnessed. It is always a great start to the wedding celebrations! Please see The Magic Section for examples of some of the effects I can perform. "Dear David, thank you so much for being your usual outgoing, miracle working self on our wedding day and for staying on the extra time!! Our guests were amazed at your talent and you have been the main topic of conversation for many, yes even over the bride and groom!! Wedding photographs are so important to the happy couple, but it often means a lot of waiting around for the guests. So instead of worrying about whether your guests will be getting bored, I can step in, astound and amaze them, keep them entertained and leave them laughing, smiling and joking. On many occasions, the magic performed at this stage of the wedding almost turns into a cabaret magic show as a large crowd gathers around me. The sound of people cheering and laughing is often heard throughout the venue. It's a wonderful way to keep your guests amused and entertained! "David was absolutely wonderful, I do not know where to begin really. The magic was truly impressive, unbelievable actually, and everyone was amazed by it all. One of the children became David's shadow on the night and David did not mind at all, even giving him a pack of cards of his own. Everyone was asking where we found the magician, I think David will get a few more bookings from our family and friends. David thank you for helping make our day the best ever." There can often be delays and even more waiting around for the evening wedding reception. The venue or function rooms are being set up; the DJ is getting his equipment ready; you're waiting for coaches or cars to take you on to a different venue. If there's any kind of delay, a little bit of magic can make sure that everyone remains happy and content. And then the reception itself. I always save some very special magic for the bride and groom and can perform magic that is entirely personal to the couple if required. I recently themed an entire wedding magic show around dolphins. The bride was mad about them! 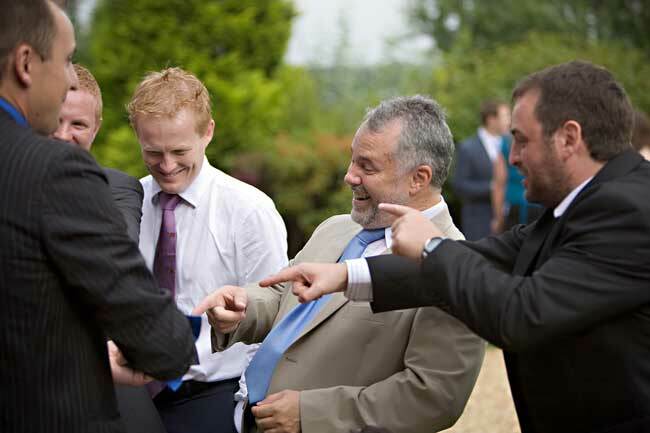 I pride myself on making sure that at every wedding reception, I make people scream with delight, cheer and laugh – after all, that's what a wedding should be all about, everyone having a marvellous, wonderful time. If you have a DJ playing loud music or a live band in the background or if you have any foreign or deaf guests .....not a problem, I have developed my act in such a way, that I can cope perfectly with this environment, years of performing abroad to non English speaking audiences meant that I have had to learn to perform my whole act silently too, relying heavily on mime and visual communication. Many UK wedding venues now require any magician who performs there to have public liability insurance. As a member of Equity (the actors and entertainers union) I automatically have public liability insurance up to £10,000,000. (I've not had a claim on it to date!). The full details can be found on my F.A.Q Page. If you require any further information reference this or have any queries, please don't hesitate to contact David. His details can be found on the Contact page. "We booked David to perform at our recent wedding reception, and despite being involved in a car accident on the way David showed what a great professional he is by still managing to get to the venue. When he arrived he was straight into his stride and literally had people open mouthed in amazement and joy at the extraordinary feats he was performing. It was wonderful to see the delight and disbelief of all of our guests as David performed. He is a class act and was an integral part of our special day. The range and quality of his skill has to be seen to be believed and I would have no hesitation in recommending him to anyone who is organising a party. Our guests haven't stopped talking about him and how impressed they were.